Realm of the Underworld Wave 2 is now up for pre-order. If you want an idea of what these figures are like, here’s a review of the skeletal Archfiend at Infinite Hollywood, and Doomkick has reviews of Hercules, the Acromancer and the Archfiend & Skeleton Minion. In related news, DrRampageo stood us up AGAIN at last week’s Toy Geeks Meetup. I’m beginning to think he doesn’t exist and is just an online-only avatar of some toy-obsessed artificial intelligence. Speaking of skeleton minions, I missed out on the Revoltech Skeleton Warrior from Jason & the Argonauts last time around. It’s being re-released in September (BBTS), and I won’t miss it this time. DoctorKent has (very quietly) announced Club Mordle over on his blog. 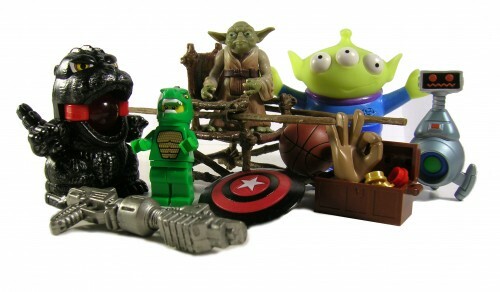 Once the store is up and running you’ll be able to join the club at Toyfinity. What the hell are Mordles, you ask? Here’s a good rundown. I wasn’t particularly interested in the reveal of the Xbox One, but one thing that was much-discussed was the lack of backwards compatibility. There’s an easy solution to that problem, and one I decided to follow some time ago – don’t get rid of your Xbox 360. I wish I still had my NES, SNES, Genesis, and N64. I haven’t actually watched this yet because I hardly ever watch videos online (seriously, even getting me to watch a movie trailer is like pulling teeth), but here’s a Funny or Die video with Kylie Minogue as the star of a fake She-Ra live-action show. Oh, if only it was as simple as "Hold onto your Xbox 360" – the problem is that I'm the only person I know who owns a 360 which hasn't Red Ringed. Most of my friends have been through two or more 360's, and that's terrible – for as excellent as that system's features and software were, the hardware was/is craaaap and is much more fallible than any prior console I can name. I should know, I own most of them. It worries me that if my console fails, and I can't get a replacement, I'll end up with so many hundreds of games I'll never be able to play again, and some of my fav games of all time are on 360. I went through way more Red Ringed Xboxes than I deserved to, but the Slim I've had is fine. You're right, though, most of them will probably die sooner than other consoles. I'm glad I'm not the only one who gets annoyed when he sees that an article he's interested in is actually just a video, and leaves without viewing it. I’m just busting your chops 🙂 It’s all good. Someday we’ll meet, I’m sure. Pingback Club Mordle is Open!